Hey Tampa, Lisa here with an update on arts and culture in Tampa Bay. Opera Tampa the resident Opera company of the David A. Straz, Jr. Center for the Performing Arts is hosting Libations & Temptations. This event will be on Tuesday, December 13 from 5-7pm at Maestro&apos;s Restaurant at the Straz Center for the Performing Arts. So what exactly is this event? It&apos;s a chance for networking, libations, food and fun. It&apos;s cultural networking for the sociably conscious. There will be an appetizer buffet of gourmet cheeses, fruits, flatbreads and crackers, prize drawings, a musical visit from opera luminaries and more! Tickets to the event are $10 and include two drink tickets per person. They can be purchased at the Straz Center ticket office or by calling 813-229-7827. There are two other dates in 2012 as well. One is Tuesday, January 10th and the other is Tuesday, April 10th. 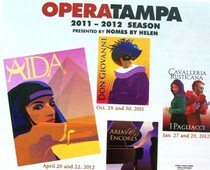 For more information check out the Opera Tampa website! If you&apos;re looking for a night out on the town with some good food in a great location this is the event for you! Come on over to the Straz Center for the Performing Arts! That&apos;s it for me, but check in later for more things to do in Tampa Bay!